25 Jan Post by Whitney Zed Filed under The Gorgeous Lifestyle. Tagged David Sims, fashion model, photography, Stella Tennant. 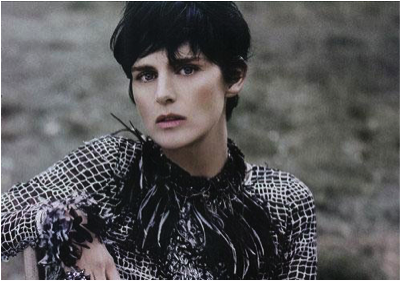 Stella Tennant, famed Scottish fashion model, was discovered by a British Vogue writer in 1993 at the age of 23. She was selected specifically for a reality profile piece, “Anglo-Saxon Attitudes,” shot by photo great Steven Meisel. Having completed boarding school and her Fine Arts degree, Tennant was nearing a husband and family as opposed to unexpected, instant stardom. Meisel was again on board to shoot the Versace campaign featuring Tennant and Linda Evangelista that same year. A hair transition from light-brown to black and cropped ensued multiple international magazine covers, Paris runways, and an exclusive contract with Chanel. Tennant remained true to her original course, announcing her retirement in 1998 to prepare for her first baby and a wedding. Each year, and four beautiful children since her attempted retirement, Tennant has graced a catwalk, campaign or magazine cover, at times including her children in the project. Her invariable success is partly attributed to her muse-like reputation to those behind the camera. Tennant’s look is unique, emotional expression vast and confidently animated – qualities that mark an extraordinary personality and talent among editorial models. The model/photographer relationship is integral to one another; inspiration and feeling develop and translate to the viewer. Tennant is stunning and cohesive in any setting, though she’s often captured in rual outdoors, making way for her bold presence (and fashion) to herald her authentic self. Royalty in her lineage is not surprising amid her modern, gypsy glamour, marking her impeccable, yet original, personas. David Sims, a notoriously private photographer with a non-fashion credo and evolving poignant style, first photographed Tennant in 1995. This marked his first influential campaign (Yohji Yamamoto), 10 years into his own career, and the beginning of an ongoing partnership with Tennant to date. Sims’ independent spirit and energy-fueled visions dovetailed with Tennant’s similar features. The 2011 British Fashion awards provided Sims the opportunity to present Tennant with the Model of the Year award. The ongoing success in an unprecedented field for each in this duo is surmounted by their respective, unwavering passion and undoubted respect for themselves and each other’s talent. Stella Tennant and David Sims are two mere examples of following a dream while incurring a few surprises on the way. By staying true to their visions and passions, they saw success along the way, making their vision brighter than they may have imagined. The chemistry between the two is likened to the idea of synergy, the collaboration of two or more ideal subjects to produce a greater, positive result than would otherwise be produced on its own. Internal synergy is an integral piece to our own happiness; listening to and following our instincts, avoiding compromise, and striving toward our personal goals all add up. “Energy flows where attention goes,” lending a positive attitude that will go far toward creating a gorgeous lifestyle.